MAPEI® Ultraplan® Easy high-performance Self-Leveling Underlayment is perfect for quick-turnaround leveling, smoothing, and repairing applications of interior floors prior to the installation of floor coverings. 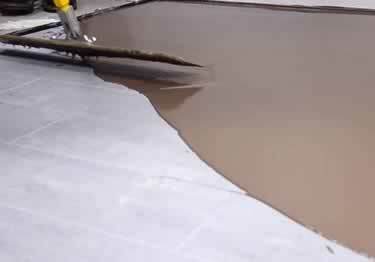 This high-hydrated cement technology is quick setting and usually only requires a clean, soundly bonded substrate before application, saving time and expense. Ultraplan® Easy is high strength and is ready for light foot traffic after just 2 to 3 hours and ceramic tile and natural stone installation in just 3 to 4 hours. Fast cure times! Ready for tile in 3 to 4 hours, light foot traffic in 2 to 3 hours, floor coverings like carpet, vinyl sheet, VCT, rubber and engineered wood plank, etc. in 16 to 24 hours. See product data sheet below for more information. Approximate coverage per bag: 1/8" thickness coverage 48 sq.ft., 1/4" thickness coverage 24 sq.ft., 1/2" thickness coverage 12 sq.ft. MAPEI® Ultraplan® Easy high-performance Self-Leveling Underlayment is perfect for quick-turnaround leveling, smoothing, and repairing applications of interior floors prior to the installation of floor coverings. Large or small tiles, ceramic to stone, provides for lippage-free results. Beautiful tile installation results quickly.